“There it is,” I whispered to myself, just barely audible over the sound of our rental car’s engine. Beyond the dashboard, past the horizon with its winding road and dusty red flatness that expanded in all directions, a handful of jagged rocks reached skyward. We’ve admired tall mountains, and we’ve admired natural wonders on all seven continents, but there’s nothing quite like Monument Valley. 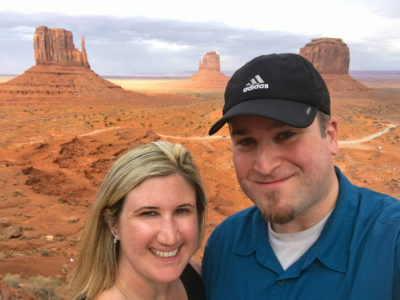 Our first drive through Monument Valley was in 2012, a whirlwind two-day road trip with my sister and brother-in-law that afforded us only enough time to see the landscape from behind dusty car windows as we pressed forward to Las Vegas, Nevada. We all agreed it would have been better to have more time there, but yet it was still best to see it quickly than not at all. 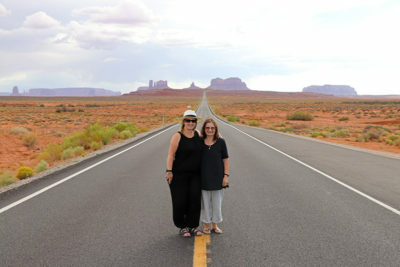 Our second visit to Monument Valley was also part of a road trip, again en route to Las Vegas, but this time it was a priority rather than a beautiful landscape speeding past our windows. 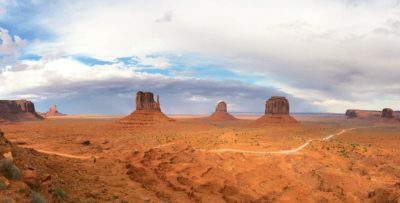 If you are curious about how to incorporate Monument Valley and the surrounding area into your vacation, here is what we love about one of the American Southwest’s most iconic destinations. 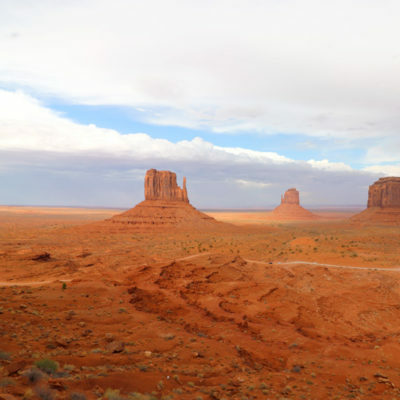 Stradling the border between Utah and Arizona, Monument Valley is a stretch of land characterized by enormous sandstone buttes that reach as high as 1,000 feet into the sky. 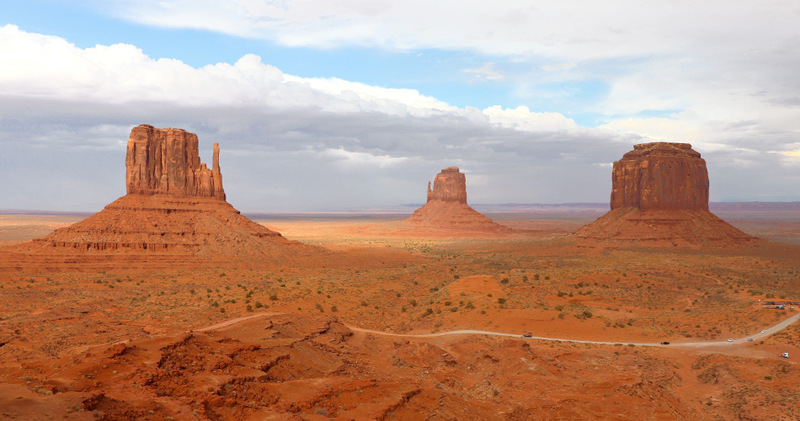 The land is part of the Navajo Nation, although the Navajo were most likely not the region’s first inhabitants. Some evidence suggests the Anasazi tribe lived there until around 1300 AD, when they left the area. The Navajo arrived sometime after that, and they continue to call it home. 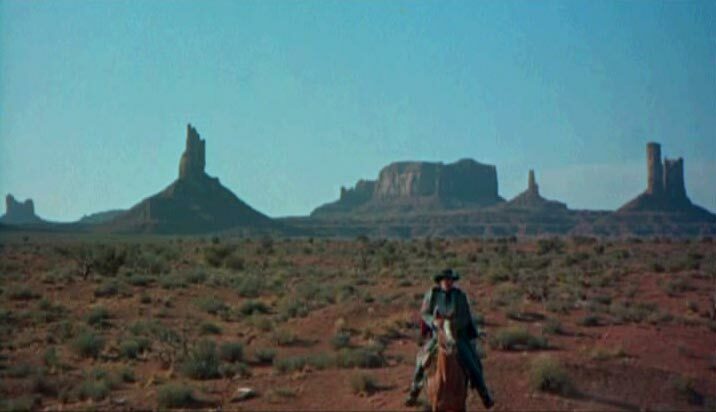 Today, many people are introduced to Monument Valley through movies; dozens of classic Hollywood Westerns and wild west films such as Stagecoach, Once Upon a Time in the West, The Lone Ranger, and Back to the Future Part III were filmed on location. One of our favorite travel movies), National Lampoon’s Vacation, also includes a hilarious scene featuring Monument Valley. It’s important to recognize the significance of Monument Valley to the Navajo, the Diné as they call themselves in their native tongue. 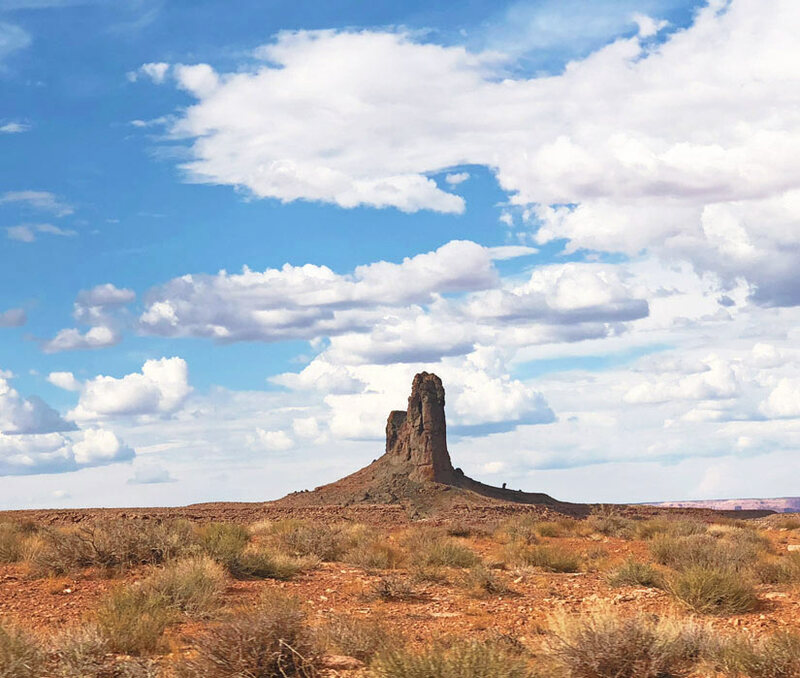 The stories they have passed down through the generations tell of a people who organized the earth and heavens under the guidance of the gods, and Tsé Bii Ndzisgaii—Monument Valley—is part of the land they cultivated. The Navajo have lived in Monument Valley for centuries, and it holds a remarkable amount of spirituality and importance to them. 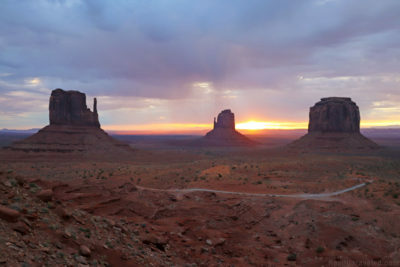 To visit Monument Valley is to experience this and see firsthand the connection the Najavo maintain with the earth. 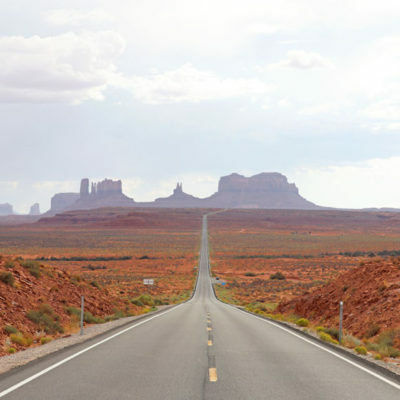 To find Monument Valley, the only road that will take you both into and out of the area is Highway 163. 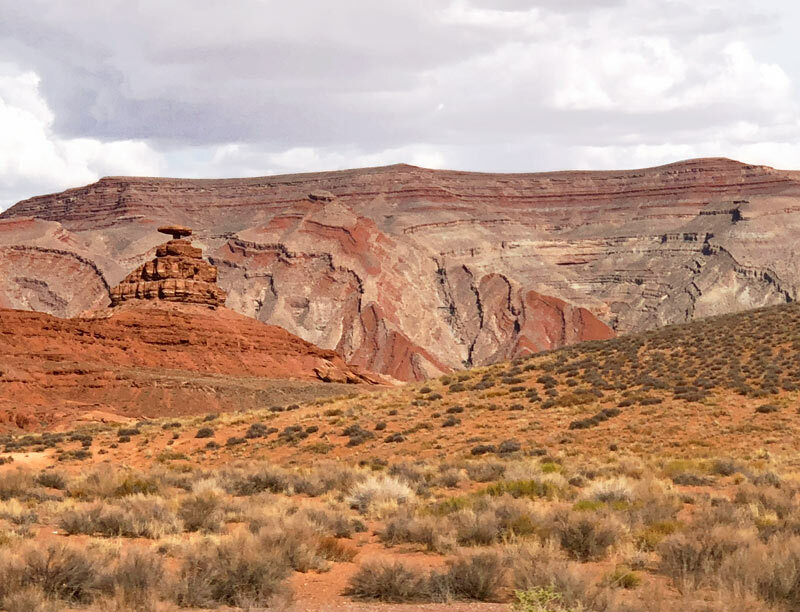 You can see plenty of awe-inspiring formations from that highway, although many visitors will continue on to the road that winds through the Navajo Tribal park, where some of the most recognized buttes are located. This loop isn’t free; the entrance fee is 20 USD per car (not per person!) and will guide you past the visitor’s center located at The View Hotel before setting you on a 17-mile loop. 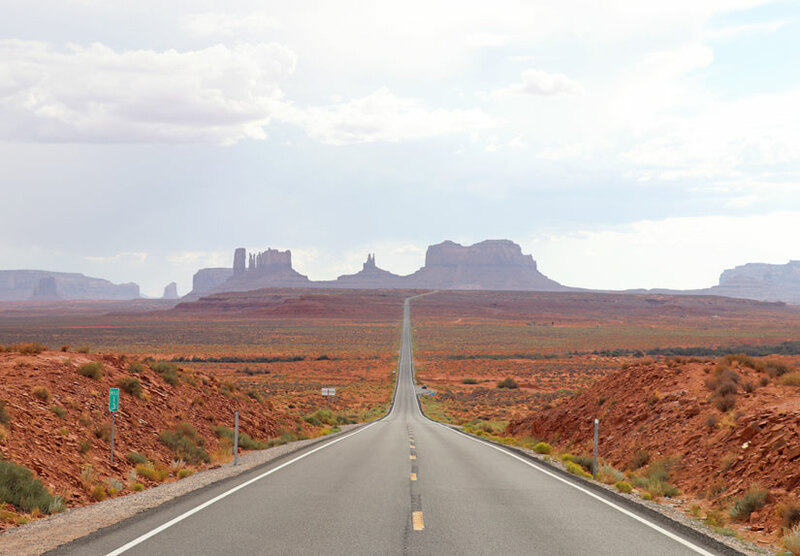 If your journey takes you to Monument Valley, it is worthwhile to spend the money to drive the road. 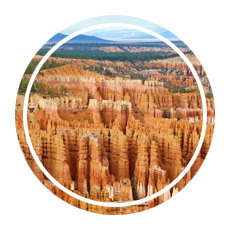 Although you can circle through in less than an hour, dozens of viewing points will tempt you to pull over, get out of the car, and spend a few more moments taking in the scenery. Most people spend several hours driving through the area. The loop is only open during the day (typically from sunrise to sunset), so it’s a good idea to confirm the hours of operation before arriving so you won’t be rushed—or, worse yet, miss the experience altogether. 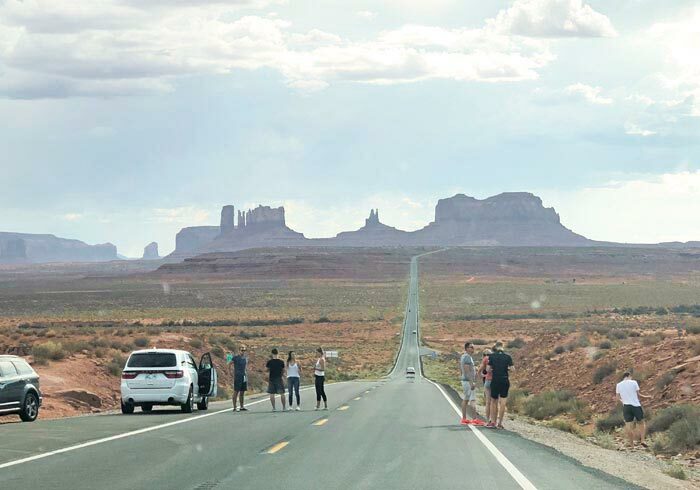 If you have seen the movie Forrest Gump you have seen Monument Valley, which famously provided the backdrop to the scene where the title character pauses after a three-and-a-half year run, looks at the crowd of disciples following him, and proclaims himself to be tired. “I think I’ll go home now,” he says, walking through the crowd as it parts for him. A drive down Highway 163 will take you past this exact point, where hundreds of people a day recreate Forrest’s realization that he doesn’t feel like running anymore. Forrest Gump point is recognized by Google Maps, so it’s easy to navigate to and find the exact spot on the road captured in the motion picture. If GPS isn’t an option for you, just look for the throngs of people taking selfies in the middle of the road. We had no trouble parking our car, but taking a great picture posed a problem, as there were many people milling about, dodging cars (which have the right of way! ), and posing for their own iconic shot. If getting a picture—of yourself or the scenery—without people in it is a priority for you, drive past the crowds just a tenth of a mile down the road, where you can pose with nothing but the gorgeous natural background behind you. It’s not the exact spot where Forrest stood in the movie, but you’ll be treated to a better picture and a quieter moment to enjoy. Remember that Highway 163 is a roadway—it’s not just a selfie spot. If you choose to take a photo from the middle of the road, be sure you are well-aware of any vehicles in the vicinity. The speed limit is high enough that cars may not be able to stop quickly depending on when they see you in the road, and with drivers potentially distracted by the landscape they may not be as focused as they should be. Pictures are great, but your life is much more important: be sure there are no cars coming from either direction before attempting to take photos from the middle of the road. If you do see a car approaching, don’t wait to return to the side of the road—vehicles may be traveling faster than you think! From the Monument Valley visitor’s center you’ll see two of the most iconic formations in the region: the East and West Mitten Buttes. 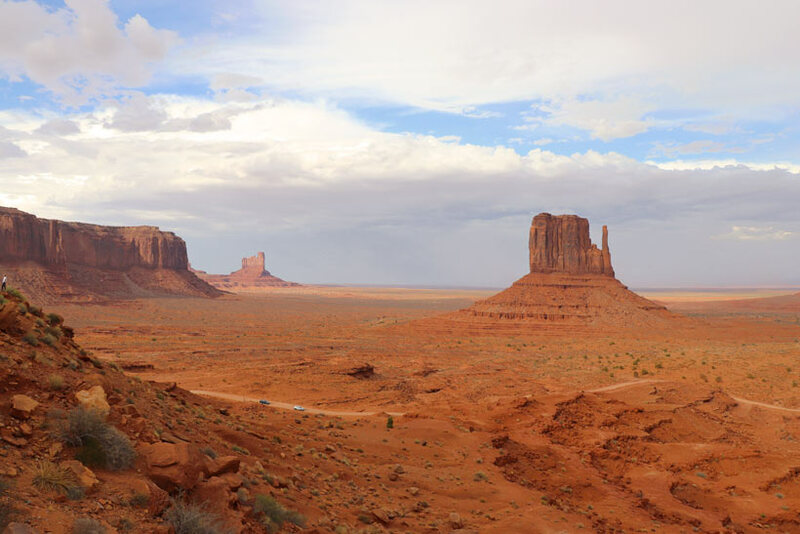 Appearing like two mittens with their thumbs pointed inward, the red shale and sandstone buttes are two of the most recognized features in Monument Valley. The Navajo believe the mittens are the hands of a god, welcoming and protecting them within their home. 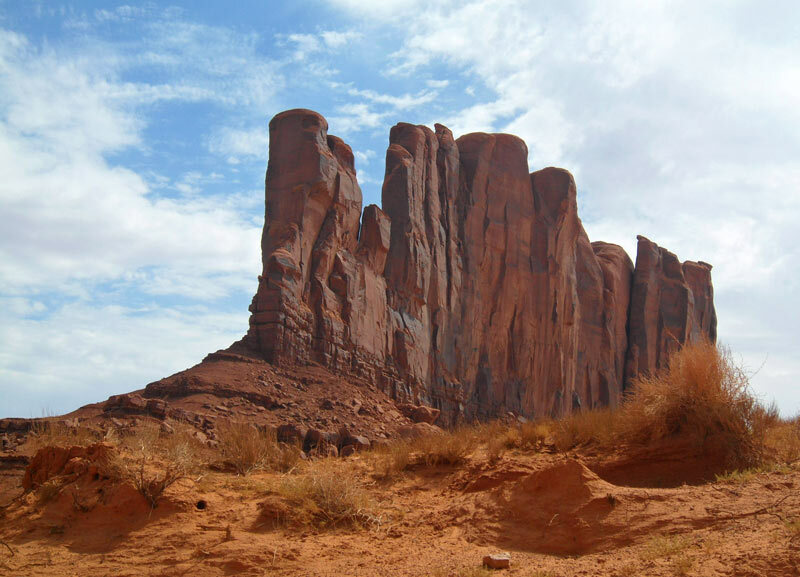 Wildcat Trail, the only self-guided hike available to Monument Valley visitors, walks past the base of the West Mitten and is a great way to appreciate their enormity. Neighboring the East and West Mitten Buttes, Merrick Butte is just shy of 1,000 feet tall and is unmistakable when looking for it from the Visitor’s Center. 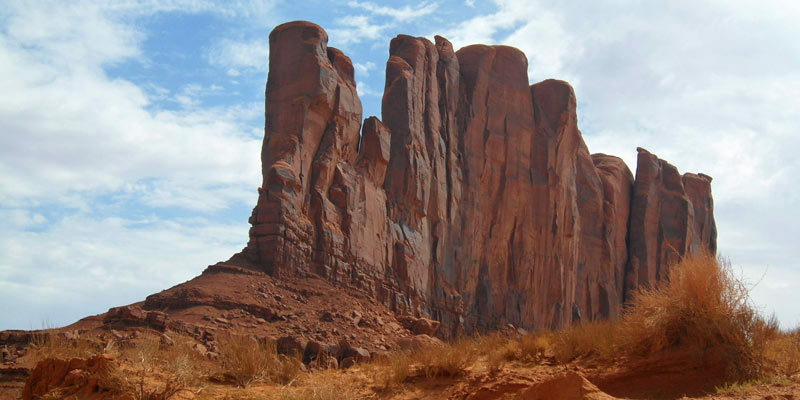 Like the Mittens, it glows red from the sandstone, especially against the brilliant blue sky on a sunny day. 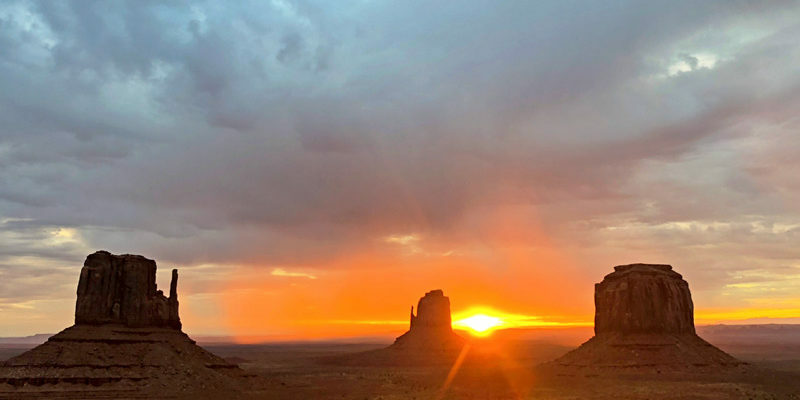 Our visit to Monument Valley was timed with sunset; we reserved rooms at The View Hotel, which meant we had uninterrupted access to the incredible view as the sun dipped below the horizon. Monument Valley looks different depending on the time of day you visit, and as the sun started to set the Mittens and Merrick Butte stood tall with the redness of the rocks and dust intensifying until the sky began to darken. 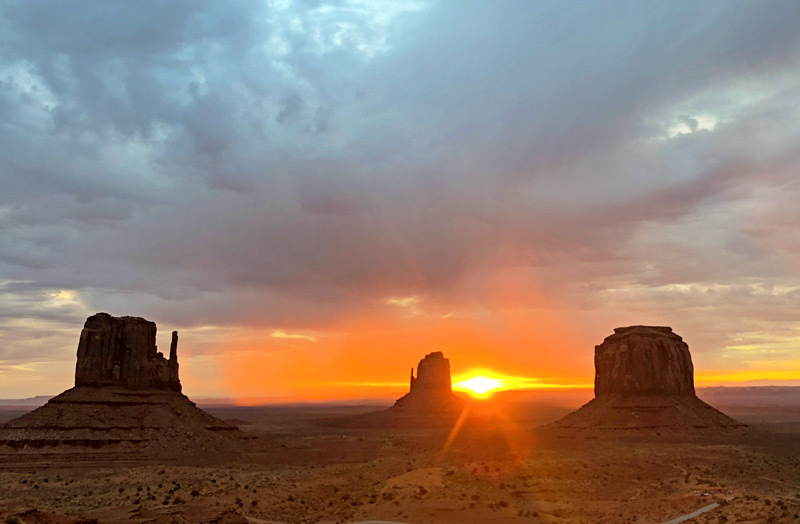 There is a Navajo proverb that tells us, “Be still and the earth will speak to you.” There is perhaps no better place to hear the earth than Monument Valley. Sunrise is a special time of day no matter where you are on the planet; we often make a point of waking up early to appreciate the quiet before another busy day begins, and there’s something peaceful about watching the sun peek over the horizon as the landscape regains the color drained from it by the night sky. 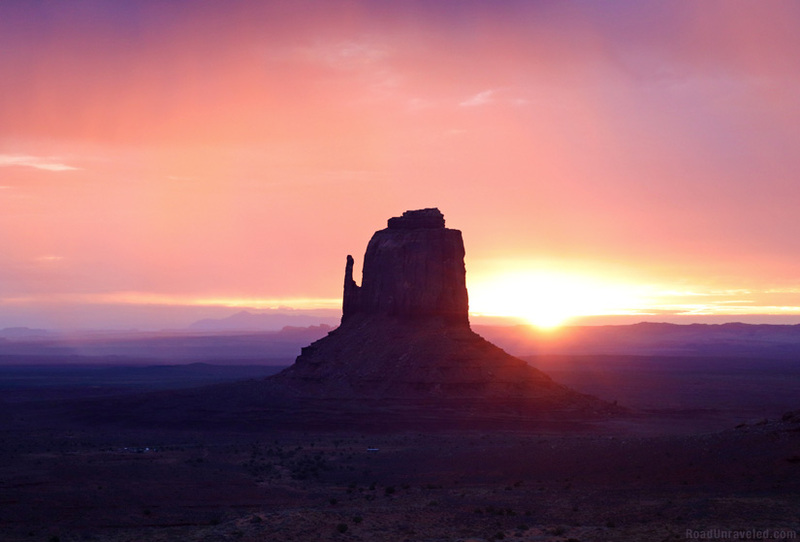 Monument Valley comes alive at sunrise; the pinks and purples and oranges give a voice to the rocks that the Navajo can effortlessly hear, and it’s impossible to feel anything other than appreciation for the moment. We watched the sunrise from the balcony of our hotel room at The View, and as the sun emerged we heard only the muffled clicks of camera shutters as fellow guests captured the scene. After a while the clicks and whispers quieted, and the silence provided the perfect soundtrack for taking in one of the planet’s most beautiful spots. 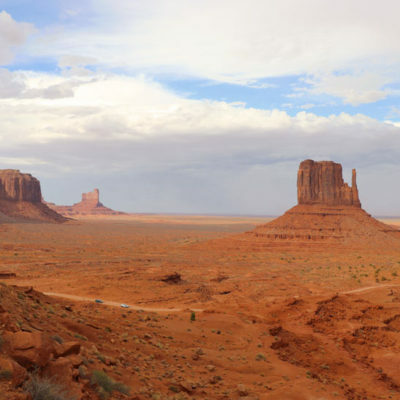 Monument Valley is a land of extremes: it can be unbearably hot in the summer and equally cold in the winter. Prepare for the elements, as any visit will have you outside more frequently than inside. It’s also important to know if storms might impact your visit; we were treated to a decent thunderstorm when we spent the night in Monument Valley, and while the Mittens looked pretty spectacular with lightening behind them we were glad to be inside—not hiking outside—when the storm clouds rolled in. 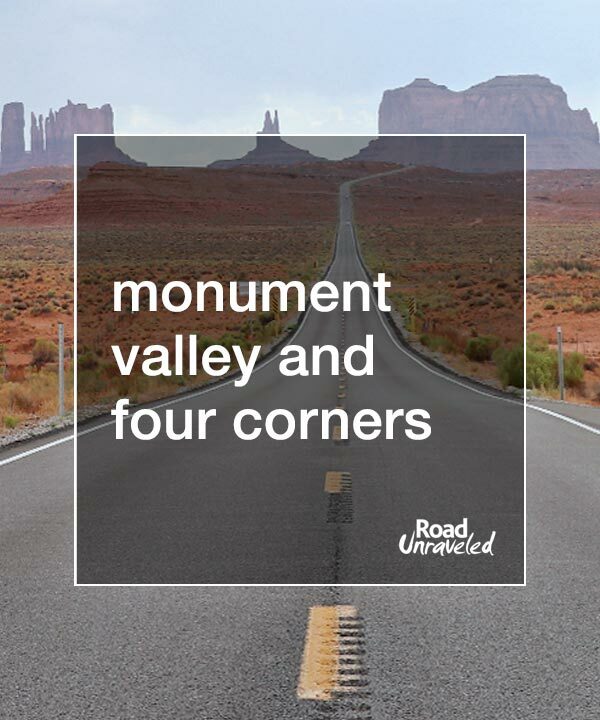 Monument Valley has a good but unpaved road network if you plan to drive the loop, so if you will be renting a car consider an SUV or 4-wheel drive vehicle. Most sedans will be fine, but a car than can easily handle the dirt roads will be your best bet. Highway 163 is a paved, well-maintained road that is easy to navigate. You will be limited as to what you can explore on your own when on Navajo territory, so a tour of Monument Valley provided by a local guide is an excellent way to learn more about the region. Tours can be booked in advance and often run year-round, and you can find tours that run the spectrum from driving or hiking to floating above the monuments in a hot air balloon. 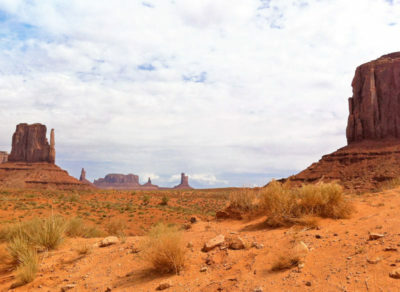 Be sure to stay in designated areas if you don’t elect to take a tour, though; visitors are prohibited from many parts of Monument Valley without a Navajo guide. Sure, you’ll want a few pictures to share on Instagram, but this is one place where we strongly recommend you put your camera down for a while and simply appreciate the world around you. Look at the vibrant colors, listen to how still and quiet it is, and make memories you won’t need a picture to remember. 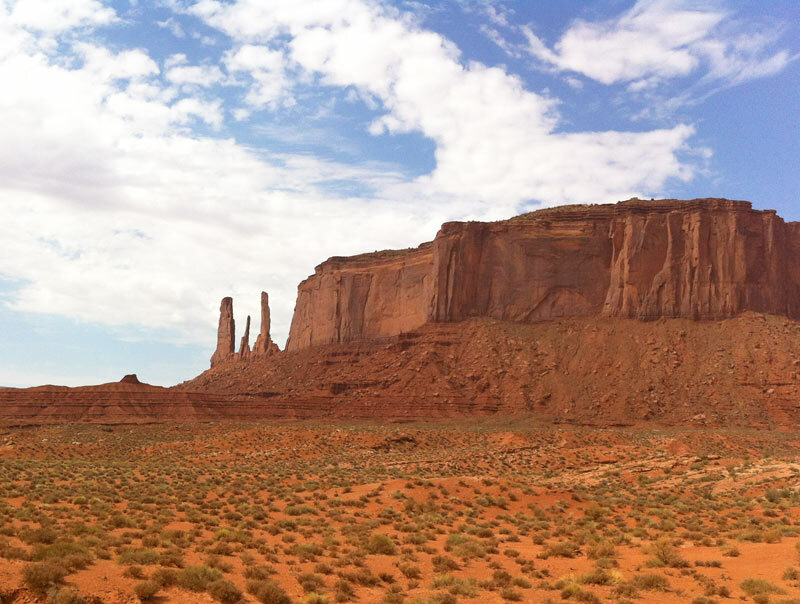 Monument Valley is gorgeous, and it’s best experienced with your own eyes and not through your camera’s lens. 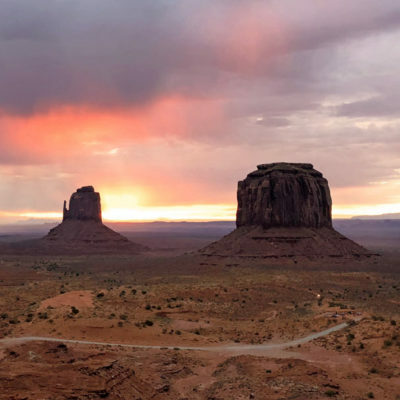 There are several small towns within a short drive of Monument Valley, but to truly experience the magic and wonder of the rock formations The View Hotel is the best choice you can make. 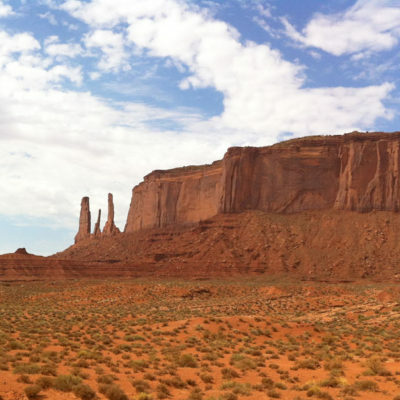 While it is more expensive than most other hotels, The View is the only hotel physically located in Monument Valley. All rooms offer a balcony with views of the Mittens and Merrick Butte, and when we visited we spent almost every moment enjoying the landscape from our own private space. The rooms are modern—ours had a TV and a strong WiFi connection—but you won’t find a swimming pool; out of respect to the Navajo people who still must travel long distances to find water for their families, it would be inappropriate to offer a pool on Navajo land. The View has a huge gift shop with some nice handmade souvenirs, and a small museum on the lower level offers some great history and information about Navajo Nation. We were also impressed with the hotel restaurant, where we had dinner during our stay. The “world famous” green chile stew was delicious and filling, not terribly spicy but very flavorful. 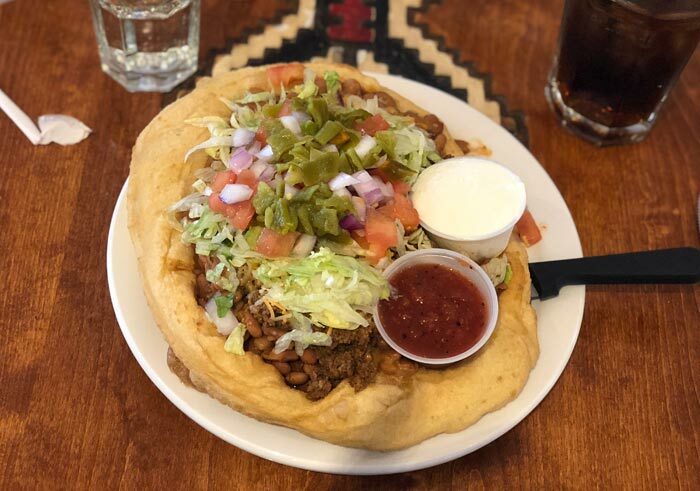 The Navajo taco was also tasty, and we appreciated the fact most meals were served with a trip to the soup and salad bar. I ended my meal with a cup of Navajo tea, which has a unique, earthy quality to it. The View Hotel’s restaurant serves meals to all visitors, but it is available only to hotel guests after the loop road and trails close at sunset. 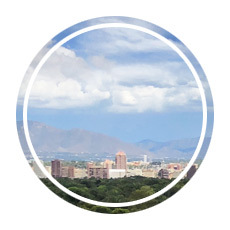 The whole hotel takes on a more intimate feeling at that time, as guests finish their meals and spend time on the viewing deck or on their balconies to stargaze or connect with friends and family. Navajo Nation is an incredible community, and a stay at the View Hotel makes you feel like you are part of it. 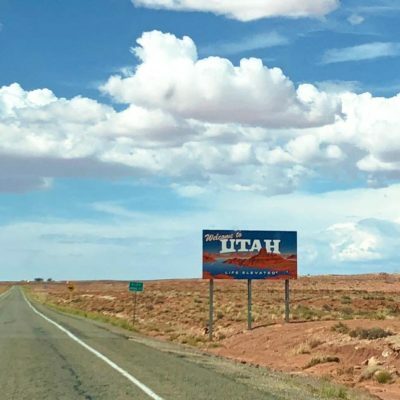 If you are looking for hotel options in neighboring towns, Bluff, Utah has several good choices that provide both price-conscious accommodations and quick access to both Monument Valley and Four Corners. 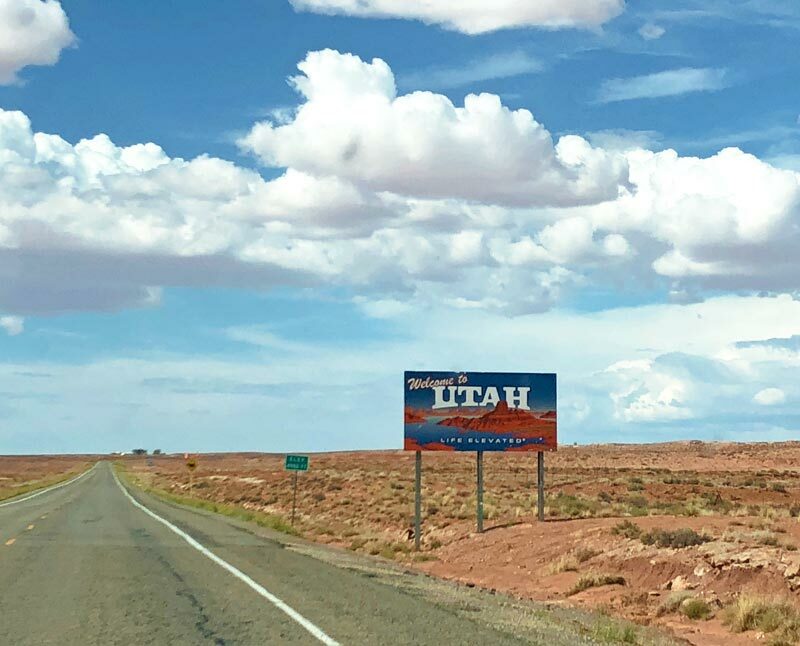 If you plan to visit Monument Valley, a 90-minute drive will take you to another notable attraction: Four Corners National Monument. Maintained by Navajo Nation, it’s the only place in the United States where you can claim to be in four places at once. Four Corners is the point where the borders of Arizona, New Mexico, Colorado, and Utah connect, forming a point where visitors stand to straddle four states. 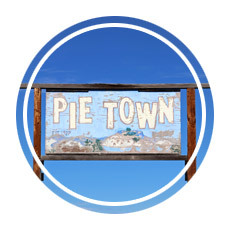 Located off Highway 160, Four Corners is certainly touristy but a worthy stop regardless. 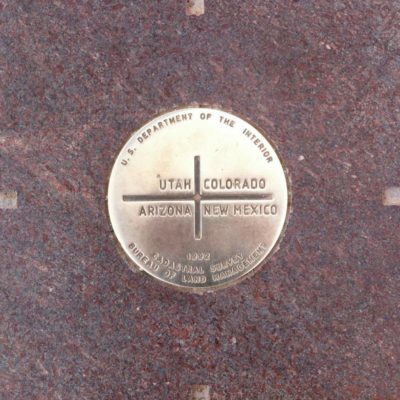 Local tribes, including the Utes and the Navajos, maintain shops selling food and souvenirs, but the main attraction is the small granite disc that marks the spot where four states meet. Tourists twist themselves like pretzels to place a hand and a foot in each quadrant, and although it’s nothing more than a boundary line it is a fun stop to make when visiting Monument Valley. 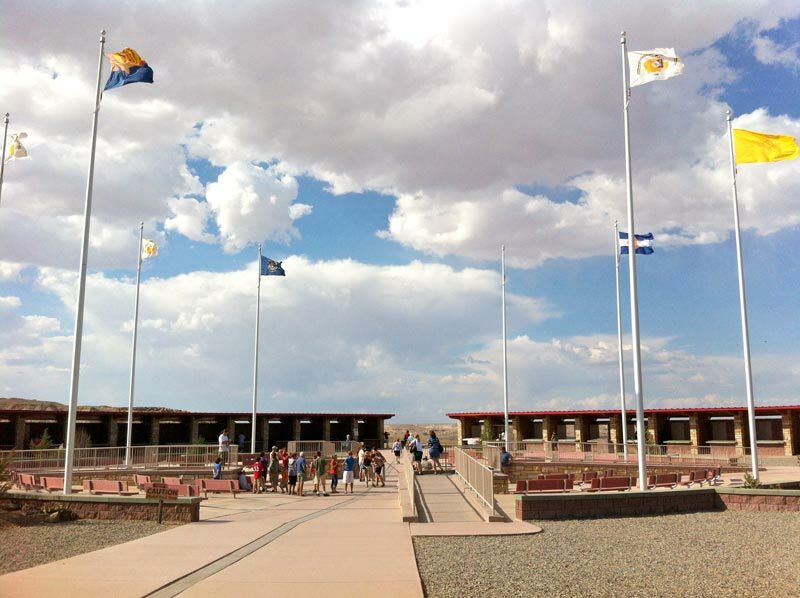 While it’s easy to spend just a few minutes capturing a photo or posing on the point where four states connect, take some extra time to explore the visitors center, where you can learn much more about the history of the native people who call the region home. 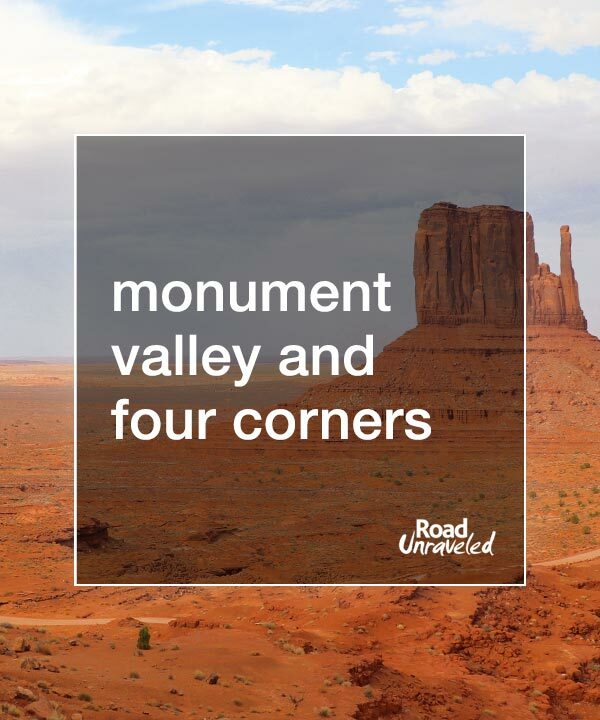 Visit Monument Valley and Four Corners! 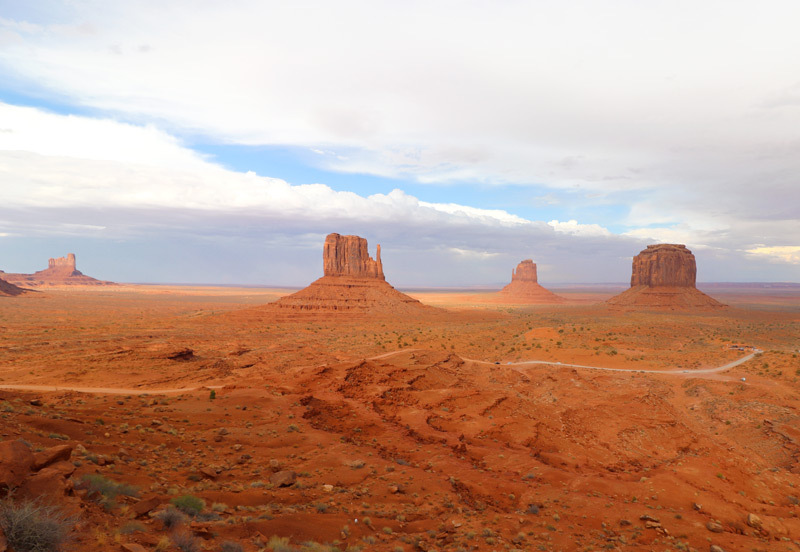 I spent a long time watching Monument Valley disappear through the rearview mirror as we departed. 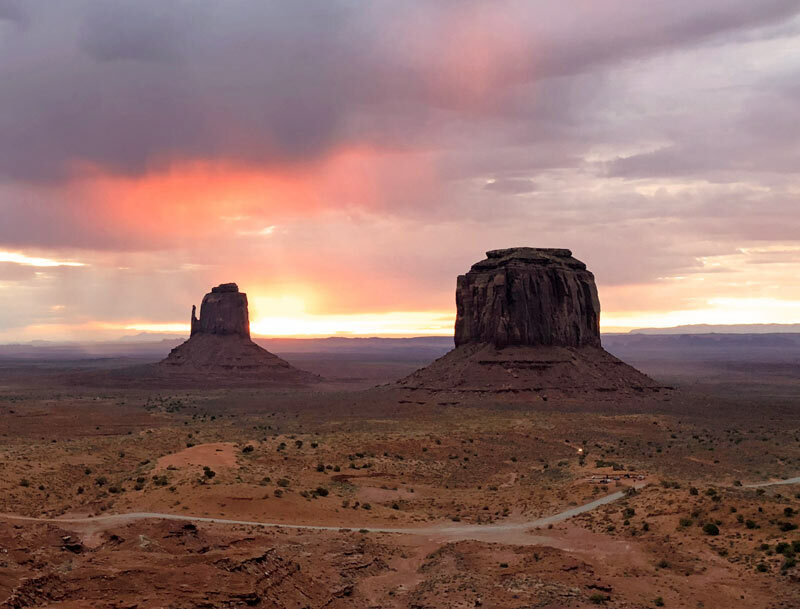 There are so many beautiful places on this planet, but Monument Valley heightens the experience with a palpable spirituality that connects the people to the earth. 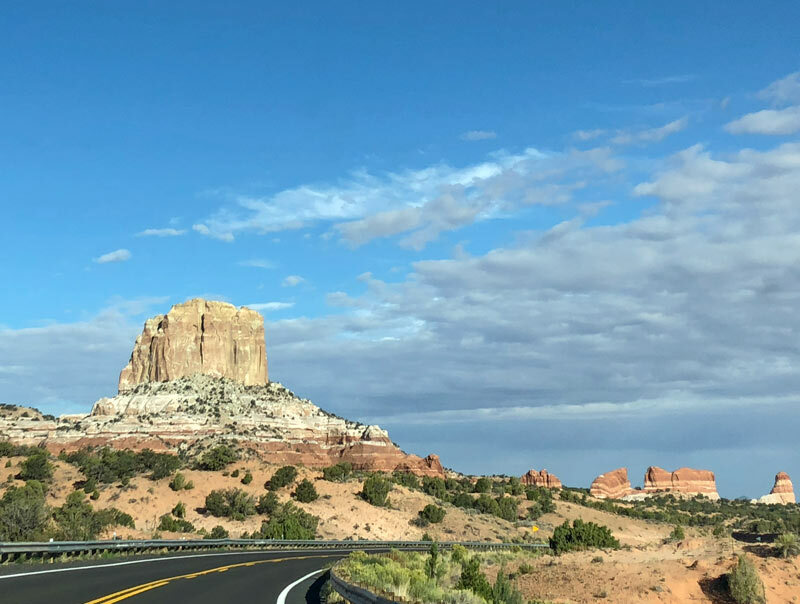 If your journey will take you to the USA’s Southwest, Monument Valley and Four Corners are two very worthy destinations to add to your itinerary. Don’t be surprised to find you leave as we did: full of delicious food, memories of incredible colors and rock formations, and a true sense of peace. 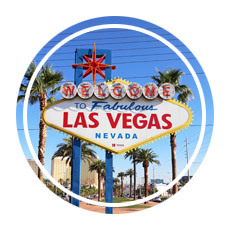 Looking for more places to visit in the Western United States? Here are a few to consider!